Stock photo of the Gates of Haast in Mt. Aspiring National Park, Haast Highway near Haast Pass, West Coast, South Island, New Zealand. In Mt. Aspiring National Park, the Gates of Haast span the rushing waters of the river. 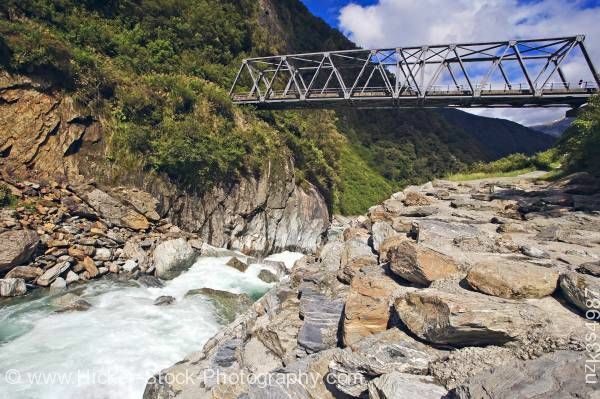 This stock photo shows the view from the ledge of Gates of Haast in Mt Aspiring National Park, Haast Highway near Haast Pass, West Coast, South Island, New Zealand. White foamy waters rush between the rocky ledges of the mountainsides. This scenic view from the rocky ledge shows the waters rushing over rocks and boulders. Rocks lay about the hillside and shoreline in varying colors and sizes. A metal walking bridge is seen overhead spanning the river. The bridge reaches the rocky ledge leading into the lush green foliage of trees and bushes that covers the high mountainside. From the bridge, your eyes follow the mountainside that disappears into the dark backdrop. A beautiful blue sky with great white puffy clouds sits over the peaks of the mountains. Gates of Haast in Mt. Aspiring National Park, Haast Highway near Haast Pass, West Coast, South Island, New Zealand.